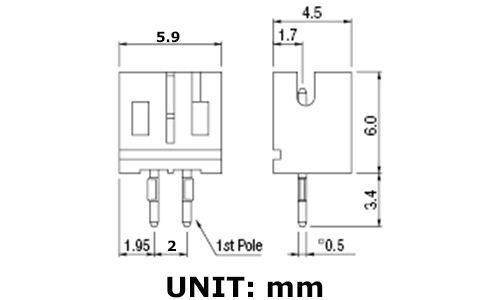 This is a JST-PH connector PCB mount, we sell them in packs of 10. JST-PH pitch (spacing between terminals) is 2.0mm. Great for connection to Lipo batteries. Protoboard 2 X 8cm (Pack of 5) These 2 x 8cm double sided Protoboard comes in packs of 5. Pin spacing is 2.54mm Quick Spec Base Material : FR - 4 Protoboard Type : Double Side Bo..
SMA Connector - 90 Deg - PCB (2 Pack) The SMA series is a very popular coax connector with threaded coupling, and can be used up to frequencies of over 18 GHz (depending on type). The impedance is co..